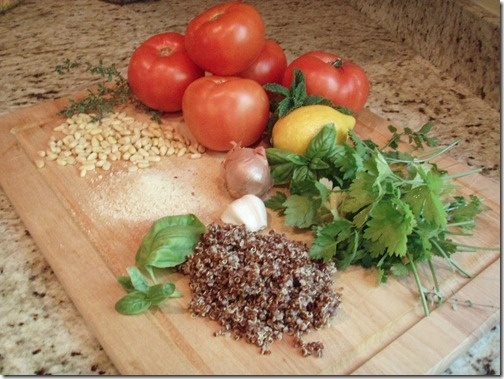 These summer herb stuffed tomatoes are filled with quinoa for a healthy, protein packed side dish or a light meal. It’s so nice to be back home in my own kitchen. I started day dreaming about what I was going to make for dinner on the plane ride home from Gainesville. I knew the weather was supposed to be gorgeous yesterday (78 and sunny) and all I could think of was something fresh, summery and light. 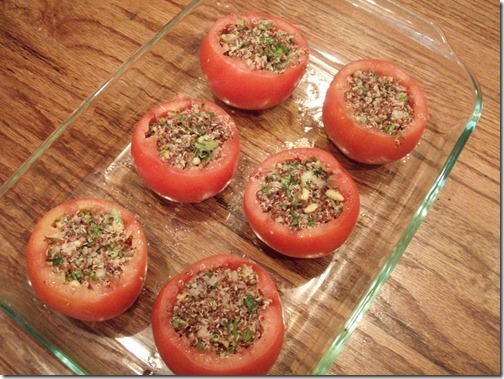 Enter herbed stuffed tomatoes. Here was how my thought process went down. Nice weather—>something summery/fresh—>lemon, must use lemon—>I think I have swordfish in the freezer from Trader Joe’s (love that store! )—> ok swordfish on the grill, but with what?—>I still have that darn quinoa to use up (told you he wouldn’t touch it while I was gone)—> maybe stuffed tomatoes?—>yes, I could use the quinoa as filling—>but it needs more freshness to it—>I’ll add in a ton of herbs. Perfect! 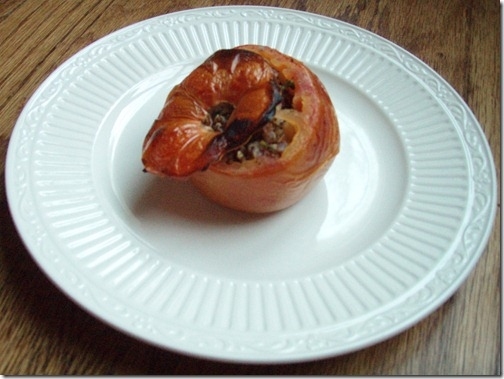 I’ve seen plenty of stuffed tomato recipes that get all cheesy, gooey, and just plain heavy. While I do love me some cheese, that wasn’t what I was going for with this recipe. Plus, usually I don’t dig cheesy things as an accompaniment to fish. See all those pine nuts? There’s no way I was using all of them. Those babies are expensive! Call me cheap but, when you pay $9.99 for 4 oz. of those bad boys you can bet I’m gonna make them last. A good tip on pine nuts is to store them in the freezer. Since they are a very oily nut they go rancid much quicker than others when stored at room temperature. 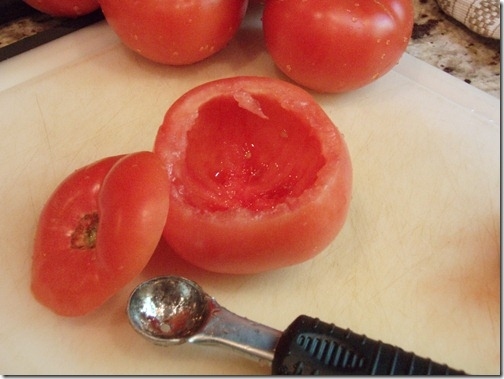 Slice the tops of the tomatoes off and gut out the insides. Careful not to tear through the bottom. I used a melon baller for this but, a spoon will work just as well. Little side note on the melon baller… This was one of those kitchen gadgets that I used to think of as totally pointless and a waste of money. I think I bought it a few years ago to make pretty watermelon balls for a summer cook out and figured I’d never use it again. Um, wrong. I use this thing ALL THE TIME. It’s very adaptable. Lightly oil a glass pan and place the gutted tomatoes in it. Season the cavities with some salt and pepper. Mince garlic and shallots and quickly sauté them to take the bite out. While that is sautéing (careful not to burn the garlic), add minced herbs, lemon zest & juice, cooked quinoa, bread crumbs, pine nuts and 1 tbsp. extra virgin olive oil to a bowl. When shallots & garlic are done, add them to the bowl as well. I actually toasted the pine nuts quickly in the same sauté pan as the garlic and shallots beforehand. You don’t have to do this but it definitely intensifies the flavor of the nuts. Anytime I toast nuts I always think of Rachael Ray on “3o minute meals” saying “your nose will tell you when they’re done!” Am I the only one who found that to be one of her many annoying sayings? Salt and pepper the mixture to taste and then fill ‘em up! Cook at 450 for about 15 minutes. I actually broiled them the last couple minutes to get a nice charred look on top. 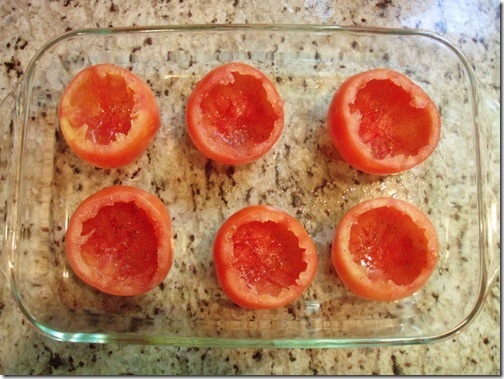 If you saved the tops of the tomatoes you can add them back on and cook them with the stuffed tomatoes. I think they make cute little “hats” so I did. Isn’t he cute all wrinkled up? This was perfect. Exactly what I was hoping for. Light, very lemony, and so fresh with the abundance of herbs in there. I thought I might have gone a little overboard as I literally picked every herb I have on my front steps except the rosemary but, somehow they all worked together. I did think about adding just a little grated parmesan but, that went out the window when I realized I used it all up for the husband’s birthday dinner a la Jessica. I think you could totally add some in just don’t go overboard as the idea here isn’t cheesy. Slice tops of tomatoes off and gut the insides to leave just a shell. Arrange tomato shells in lightly oiled glass pan and salt & pepper the cavities. Toast pine nuts in small sautÃ© pan over medium heat for about 4-5 minutes. 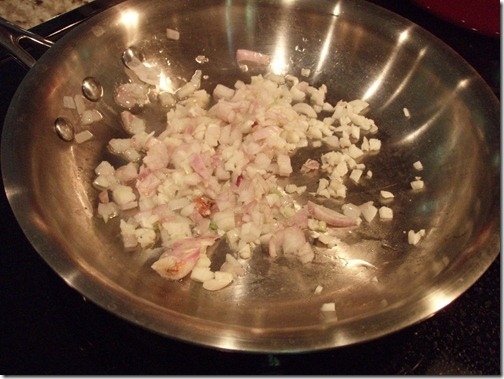 Use same pan to then lightly sautÃ© shallots and garlic in 1 tbsp. of oil. 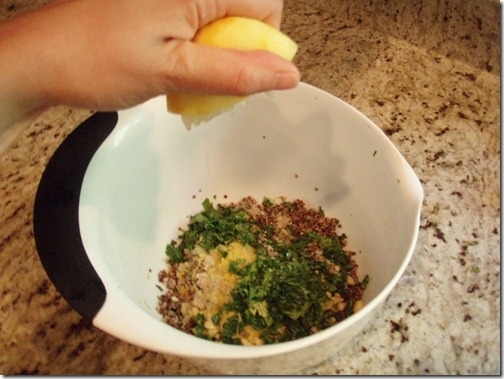 While shallots and garlic are sautÃ©ing, add cooked quinoa, bread crumbs, pine nuts, lemon zest & juice, herbs and 1 tbsp. of oil to a bowl. 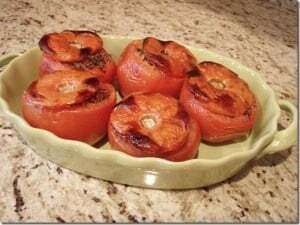 Stuff tomato shells with the mixture and add tops back on if youâ? ?d like. Broil last 1-2 minutes for charred appearance. Gorgeous. I can’t wait for my tomatoes to come in! Those look great! I’ve made a ton of stuffed peppers, but I have yet to try stuffed tomatoes.